In conjunction with Natures Images, join us in the sweeping dunes, rocky outcrops and huge skies of Namibia. With a little patience, the wildlife that can be found within this often dramatic landscape makes it a truly engaging place to visit. Photos courtesy of Natures Images. The stunning landscapes will, naturally, be on our agenda. However with desert-adapted Elephants and Giraffe, fascinating reptiles of the dunes and barren coastlines bursting with Flamingo or teeming with Fur Seals offer variety alongside the traditional game to be found in the country’s flagship Reserve of Etosha. This will be a truly immersive experience in one of the driest and dramatic corners of the African continent. This photography workshop holds a maximum group size of 6. With two photographic guides this offers an exceptional 3 to 1 guest to guide ratio. Physical activity will be kept to a minimum however there will be early starts and long strecthes of driving between accomodations. Tom Way is professional photographer and Natures Images guide who has seen success and awards in various competitions, including the European Wildlife Photographer of the Year. He favours a fine art style approach to his wildlife images and regularly exhibites his work at art fairs around the country. Day 1: We will leave Europe during the afternoon for overnight flights to Windhoek, Namibia. Day 2: Arriving in Windhoek during the morning we will collect our vehicles for the long drive north to Etosha National Park and our base for the first 3 nights, Mokuti Lodge. The lodge is conveniently based just a few minutes outside of the eastern end of the park. We will have been travelling along time until our arrival so this will be an opportunity to rest and acclimatise in the comfortable surroundings. 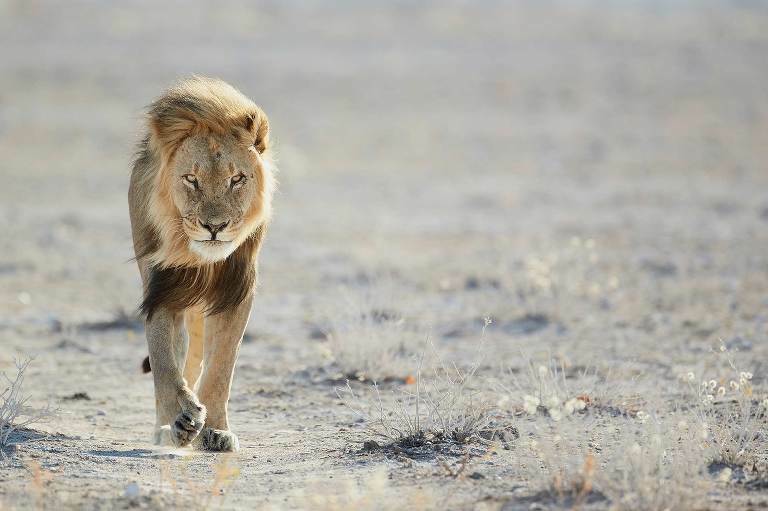 We’ll be briefed on the Etosha leg of our schedule with the local guides and drivers and get a good night’s rest. Days 3-4: Using a specially adapted VW transporter’s for the duration of our time in Etosha, these unique vehicles (along with drivers and guide) have rotating seats that allow everyone their own station to photograph using tripod heads in through large open windows. This vehicle can accommodate 4 guests each with the remaining 2 guests each shooting from our main vehicles, driven by Tom and Richard. This ensures everyone will get plenty of opportunity to work in these unique vehicles. For each of these 2 days we will explore the eastern part of the park around Namutoni, entering at dawn and basing ourselves at the best waterholes for good periods of time to allow the activity to happen and photographic opportunities to develop. A short break for lunch when the light is at its harshest will be taken back at Mokuti each day. Etosha is excellent for all the main herbivores (elephant, zebra, wildebeest, oryx etc) as well as holding good numbers of lion, leopard and cheetah so there is plenty of excellent potential. We are visiting during the heart of the dry season when all of these will look to come and drink each day hence the waterhole staking strategy. Day 5: A similar morning schedule except we make our way that afternoon to the west of the park, basing ourselves here for our final night, inside the park itself at the Okaukuejo rest camp. The main attraction here is the floodlight watering hole that provides potential to photograph black rhino, which visit most nights. Day 6: For the final morning in Etosha, we’ll spend time at the camp waterhole which often provides stunning sunrise light and offers reflections of the visiting animals. After our morning session here we’ll head west to Damaraland and our base for the next 3 nights near the settlement of Sesfontein. Day 7 - 8: Save for a few waterholes, the river valleys of this area will be dry at this time of year. The valleys however, are home to the desert-adapted elephant, giraffe and a small population of lion. Do catch the best light we will leave early each morning in our private vehicles and driver guides, to search the river valleys for these specially adapted mammals. This also offers an opportunity to try and see these often photographed animals in more unique and different settings. Day 9: Following breakfast we make our way to the Skeleton Coast region, visiting the largest breeding fur seal colony on route. Here the sights and sounds are nothing short of extraordinary and will provide an enjoyable photograph session ahead of the second half of the journey to the coastal town of Swakopmund. Day 10: A private tour during the morning into the sand dunes of the surrounding Namib Desert, with a local guide and expert in the so-called Little 5, which includes namaqua chameleon, Peringuey’s adder and palmato gecko. The aim will be to these animals up-close with macro and wide-angle lenses. The afternoon will see us spending time at the lagoons in the nearby Walvis Bay. This will take us right up to sunset and will feature huge numbers of both greater and lesser flamingos, where they gather, providing flight, portrait and group photographic options. Day 11: We’ll return to Walvis Bay early in the morning before heading south within the Namib region, to the internationally renowned Sossusvlei area. Here we will enjoy the afternoon exploring the grasslands and iconic red sand dunes before settling at our hotel near the Sossusvlei National Park. This will be our base for 2 nights. Day 12: An early start at dawn to visit the iconic Dead Vlei and Sossusvlei. The photos from here will already be familiar to you as they are unique locations for photographic opportunity. Paradise for landscape photographers in fact. From a wildlife perspective oryx are reasonably common in the area so there will hopefully be plenty of wildlife to add to the landscape opportunities. We will spend the full day here, with a break for lunch during the day. Day 13: Dependant on final flight times/schedules we hope to have a final early morning session in the park before heading back to Windhoek and our evening flights back to Europe: a perfect Namibian location on which to finish the trip. A deposit of of £545 is required at the time of booking. Tips & gratuities for camp staff and drivers, where applicable.